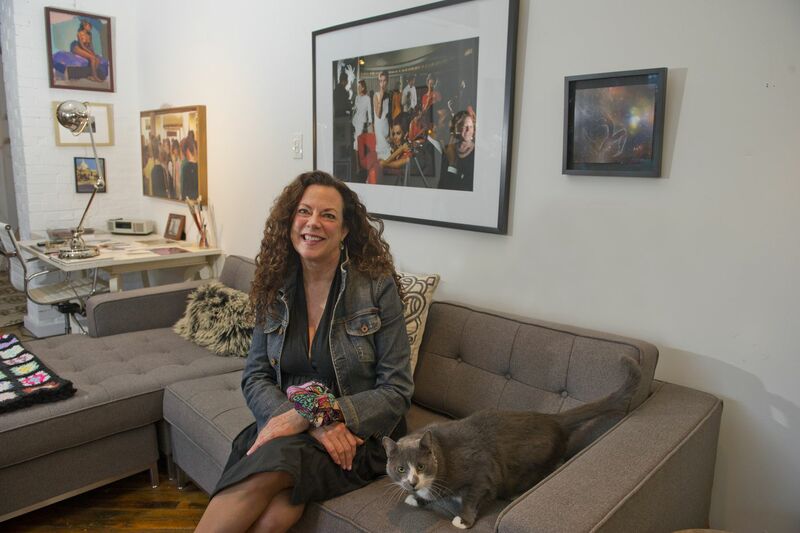 Art collector Terri Currier lives with her cat, Wally, in an old candy factory redeveloped by John Cunningham of the Birdnest Group. After living in the Philadelphia suburbs for almost three decades, Terri Currier was ready for a change. She found it in a rented Kensington loft, a converted candy factory with 16-foot-high ceilings, huge windows, and an open floor plan. It was a blank canvas to create a cozy space to share with her 15-year-old cat, Wally, and 68 paintings and other works of art. Her goal was to create a casual space that invited creativity. The main living area has four sofas — “you can never have too many sofas,” she insisted — with Danish tables and a Hans Wegner shell chair, sitting among art that fills every wall. Currier’s love of art, mostly oil paintings, began in 2002 when a friend took her to the Pennsylvania Academy of Fine Arts student art show and sale. His advice was simple: Stand in front of a painting, and if you can feel it in your body, it’s meant to be with you. Seventeen years later, she is an avid collector, drawn especially to portraits. Some of her favorites include a Maya Angelou oil painting by Anna Rose Soevik, a copy of the Mark Shaw photograph of John and Jackie Kennedy that graced the cover of Life Magazine in 1959 — which Currier bought from the gallery that dealt with Shaw’s estate — and self-portraits from PAFA students. Two large bedrooms get direct sunlight from oversized windows, both sharing a hall bathroom with a soaking tub inside a large shower. To expand storage space, Currier’s fiancé, Rob Schumann, helped her install shoe racks and shelves, and to accommodate her long evening gowns, she put a tension rod through a beam high up in the closet’s ceiling to hang them. “I have a ladder to climb up because you don’t get your evening gowns down every day,” she joked. The kitchen features a deep sink with an industrial-looking faucet. A platter by the iconic Swedish fabric designer Josef Frank sits on the butcher-block countertops that Currier refinished. The living room is filled with plenty of art and seating to enjoy it. The building itself is believed to date to the early 1900s. Sometime around 1950 it became a candy factory, said John Cunningham of the Birdnest Group, who began developing the building in 2016. “I walked through it the first time and knew it had great bones and that there was a lot of potential,” he said. An old piece of candy-making machinery sits in the hallway, nearby a unique large silver barn door. Currier compares her Kensington neighborhood to middle age — “you wear your wrinkles proudly and have brought all these experiences in,” she said. Though she is mindful of Kensington’s issues with drugs and crime, she feels safe among the neighbors she has come to know well. The kitchen features a platter by the Swedish fabric designer Josef Frank. Currier enjoys cooking when her sons, Will, 25, and Ben, 23, and her fiancé visit. Set to marry in September 2019, the couple met in an elevator; he asked her out before it reached his floor. A retired private-practice lawyer, Currier is taking the lessons she learned in decorating to launch a new business helping people curate their own spaces. The master bedroom, filled with light and art.